I focus on China for the International MBA program and Executive Education – the topic cuts across many academic disciplines. In addition I run the Global Immersion program in Shanghai for the MIM program. I also lecture in the Owner’s Management Program (OMP) on the topic of leadership, focusing on power and managing politics; and have taught Sales to the MIM, MBA, and executive programs and run various innovation workshops. I’m from Gradyville, Pennsylvania, USA – a small town outside Philadelphia consisting of a fire station, post office, gas station, and an antique shop, all around one main intersection. I left when I was 18 and never returned. Although, the irony is I have come full circle: I now live in a small village, population 600, an hour from Madrid. So what’s it like living in Spain? I don’t want you to publicize the many ways it is superior, especially in terms of quality of life, lest more people find out and come here. Most Spaniards don’t realize how good they have it. There’s a reason my wife (who’s Spanish) and I have chosen to live and raise our children here. Tell us a little bit about your (professional) background. I arrived at IE after a 20-year career in the corporate world, holding senior positions with multinationals in China, the US, and Europe. I studied history and political economy in college in the US, and my first job after graduation was in Beijing. I wanted to be a journalist, but after a year as a copy editor at The China Daily, I joined a small US company in China and spent the next four years setting up the Beijing United Family Hospital, the first private hospital in China. I did everything – negotiating the joint venture, financial planning, construction, setup, initial operations…it was much more than I was qualified to do at that age, but I loved it. I fell in love with China (this was the early 90s when the country was opening up) — and I fell in love with the power of business to make change. That sent me to get an MBA at Stanford. There, I had the good fortune of joining Align Technology, where I spent more than a decade launching Invisalign invisible dental braces in the US, Europe, and China. I worked in commercial and general management roles, and when I left I worked as an innovation consultant and as a sales trainer. Working across cultures and in rapidly changing environments was both a joy and an intellectual challenge. My big interest throughout my corporate career was understanding people: how we make decisions, how we are influenced, how we are motivated. And that, in turn, explains the two big questions I am constantly asking. Regarding China: what can and should the West be learning from the Chinese? On leadership: why do executives who rise and lead organizations typically not resemble the “ideal” leaders touted in leadership literature or training programs? What’s the link between your work that focuses on China and the work that deals with leadership, sales, and innovation? At base, I’m interested in challenging that “conventional wisdom” which doesn’t seem to match reality: that China is not innovative; that great leaders are authentic and transparent. So, I suppose I’ve developed some tools or a mindset that leads to contrarian thinking. I also coach executives, globally, outside of my work at IE. This is critical for staying in touch with current trends. While most of executives I coach are not working in China, I find that the skills leaders and companies need to thrive in China (move fast, deal with complexity and rapid change, be able to manage relationships, and be practical and sometimes ruthless to get things done) are the skills that most leaders – anywhere – need today. What are some general misconceptions that Westerners have about China? The big one is that they are “behind” the West: low cost labor, copycats incapable of innovation. It’s pretty clear (and I’ve written on this), that in many areas, take mobile for example, China is way ahead. Mary Meeker’s internet report last year had a section, long overdue, on innovations emerging from China. If you are an entrepreneur in mobile, it’s clear you ought to go see what the Chinese are doing. I take students and executives to China and they come away stunned -it’s much more advanced than they thought. The pace of change caught even me by surprise: TenCent just took public a company that sells digital music. A decade ago, no one thought you could build a model on paid music in China! The second misconception is that the Chinese government drives everything, protecting and supporting – unfairly – Chinese companies. The trade war has certainly intensified this belief. And while there is some truth to it, in certain sectors, many Chinese companies simply outplay their western counterparts. Why can’t we just admit that many Chinese companies today are world class? To be clear, I don’t think the playing field in China is level, but the US and many western countries forget their own past, and development, which clearly supported domestic industry early on. The third misconception is that all business in China is done by “guanxi,” or personal relationships. Relationships matter everywhere, not just in China. Finally, there is the misconception that China will “develop” on the same western model, towards democracy. That’s not happening under President Xi. Did we get it wrong? To be clear, the Chinese also have lots of misconceptions about the West: That we don’t value relationships, that we are incapable of understanding China. Nonsense. But overall, I think they know more about us, than us about them — and that’s not good (if you are a Westerner). As China opens up to the concept of creativity and innovation in business, how does this affect business, from the small regional company to entrepreneurs to multinationals? The Chinese have always had a very entrepreneurial culture, and the quickly changing environment gives a premium to those who take risk, move fast, try new things, and operate lean. So I think the Chinese have been doing many of the things, for many years, which we in the West have branded creative or innovative (example: “design thinking.”) Rapid prototypes, fail fast, iterate. I mean, if you don’t do this in certain sectors in China, you’re dead. To be sure, the planned economy, terror of free thinking under Mao and communism, and traditional education with its emphasis on rote memorization, these certainly squashed creativity and innovation. But the opening under Deng in the 80’s unleashed free market forces, and many Chinese are hungry to learn creativity and innovation. It’s a great opportunity for those who teach it, and a great market to see how good your company is, because the market and competition is the fiercest in the world. China seems to be evolving so quickly. How do you personally keep up with the pace of change? One, I travel there. The Chinese say “bai wen bu ru yi jian” (seeing once is better than hearing it a hundred times). During my last trip I spent a few hours in Alibaba’s new Hema super grocery store watching people, asking questions, poking around in the aisle. Honestly, it’s over-hyped, but if you understand the market, you understand what Alibaba is trying to do. When I can’t be there, I speak with as many people as possible, who are as diverse as possible (industry, age, nationality, experience in China). I particularly seek out those who have views different from my own. But I do have a stable of people (you don’t spend so much time in China and not develop deep relationships) who I feel are insightful and thoughtful. There’s a lot of fluff and “china experts” out there who barely know the culture. Finally, yes, I read. I keep watch of the big western sources (The New York Times, South China Morning Post, Economist), China Daily (skimming to see the government line), as well a wide range set of podcasts and bloggers. Where was the first place you visited in China? My first trip to China was 1979, just after it opened. We went to Beijing and to Wuhan, my grandmother’s birthplace. I was only eight at the time but there are so many moments from that trip that are burned into my memory, and from there I can see clearly how much the country has changed. And then there are the more profound memories, moments that I now appreciate and understand better: My grandmother being reunited with three of her brothers, who were dispersed across the country in the 50’s and 60’s, whom she hadn’t seen since 1948 when she emigrated to the US. And my grandfather deliberately not making the trip with us because he had too many painful memories of what became of his brother (banker) and classmates (scientists) under Mao. Selfishly, teaching forces me to clarify my thinking. And I like being challenged; IE students are good at that. Designing my China course was one of the hardest things I have ever done: I mean, how do you teach immense, fast changing, complex “China” in 10 sessions, to someone who has never been there, nor has immediate plans to go there? 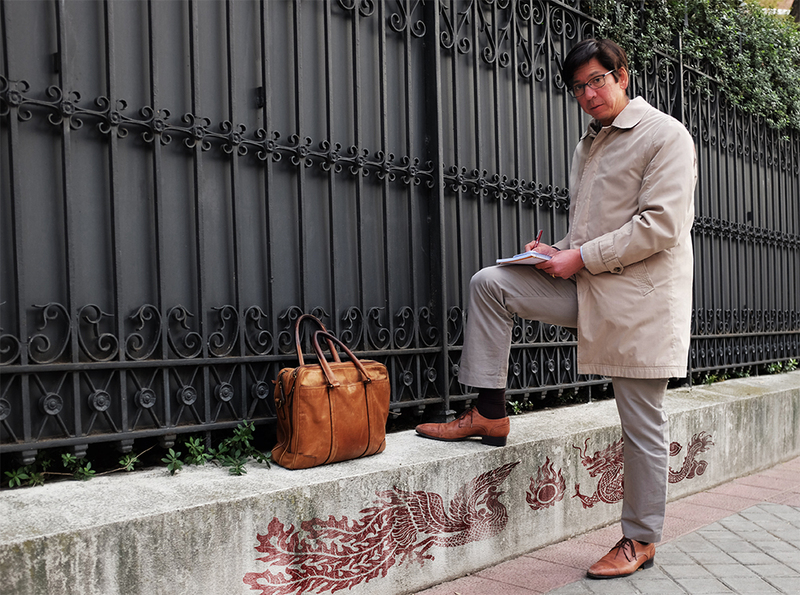 Professor Michael Wenderoth was interviewed and photographed by Kerry Parke in Madrid.